I had no idea that N.D. Wilson was releasing another non-fiction book. When offered a chance to review it, I leapt upon the opportunity. Death by Living arrived and I instantly devoured it. I enjoyed it, with a few exceptions, and walked away with appreciation for it in the end. I'm glad to have read it. I find it very easy to identify with the Wilsons in general and although N.D. has a more flippant, journalistic style than his father (a fact I'm not overly fond of), I still agree (mostly) with his theology and I like the way he, too, makes me stop and consider what I believe and how that effects the way I live life. Ultimately I think that's what I appreciate about the Wilsons - they put my brain to work and challenge my presuppositions. 2.) The Wilsons collectively enjoy satire and it shows in their writing/speaking style. Some might say that they are an overly sarcastic lot and I wouldn't agree but to explain why would take a much longer blog post. I think it does make them confusing when they don't need to be, yet at the same time I understand their reasoning. The thing of it is, I could write up a much longer explanation as to why I read this book (or any of their others) and then bothered to like it but that's not the point of this post and I've already spent more time than I meant to talking about it. The bottom line is: I like the Wilsons (both father, son, mother and daughters) and have my reasons for doing so. I recognize the fact that a lot of people want to debate whether or not I should like them but I'm just not interested in the discussion. The reason I'm not interested is buried in many books, articles, blog posts and real life experience of having attended Wilson's church, plus conversations with our current pastor and elders. No, I do not agree with the Wilsons 100% but I agree with enough and find great value in Doug Wilson's teaching that I will go on picking up Wilson (family) books and gleaning from them. I invite you to disagree with me (I can't make you stop!) and I can recognize and respect the fact that you might find my liking the Wilsons to be a grave error on my part. I'm deciding that it's ok (with me) if you don't like it if I like them. Ok, now on to the book itself (finally). 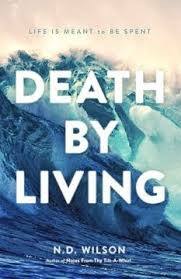 Death by Living is essential the mental-ramblings-with-a-purpose of N.D. Wilson. In all fairness, as I told Jonathan upon the conclusion of the read, if this book had been written by, say, Donald Miller, I rather would have despised it. N.D. Wilson's non-fiction is halting, rambling and somewhat chaotic. From the read I'm supposed to know more about his personal thoughts on life and living while having ascertained truths for myself. It's the "diary idea" that I don't like in Miller but since I agree more with Wilson's theology I'll be tolerant. Which might be a little hypocritical except I really don't think Miller and I are compatible at all, theologically speaking. The idea of Death by Living is to communicate the truth that we are all in the process of dying. Some of us are closer to it than others but it is coming to all. How we live this life matters and we should be thinking in light of eternity. Moments here on earth are just moments and they are definitely meant to be enjoyed. We should absolutely "go big" when it comes to celebrating life, friendships, love, new business ventures, a well-cooked meal, etc., but we need to recognize that all of these good things are mere glimpses of what's to come and should all point us to Christ. In this book Wilson relates various experiences that he has had that have pointed out to him that we are but for a moment but God is eternal and the only way to truly live life is in hot pursuit for the things of God and, obviously, God Himself. In other words, as Wilson learns more about God and applies the Bible to his own life, the more he feels the need to express his thoughts. This book is an attempt to create beauty and live life loud. Loud is a good adjective for N.D. Wilson, based on impressions and observations (i.e., paying attention to the things he writes about himself and the things he says about himself). He is a man full of energy who wants his life to be fully spent for his family and his God. He wants to tell stories that communicate truth, yes, and also that entertain and feed his children's souls and those of others. He wants to live out his Christianity and this book is a further attempt at doing so. In the reading of it I was encouraged to think more Big Picture and that's a good encouragement for me. It's very easy for me to be wrapped up in miniature moments. My kids won't nap = life is over. The laundry pile is high = life is monotonous. I'm tired = I will never be well-rested again. Ever. Moments tend to drag me down but if I stop fixating on what is going wrong I can see everything that God is building and doing in my life and in my family and take heart. When my vision is focused on God, my attitude about life in general changes. Little irritations begin to fade away. I have more energy to spare than I originally thought. In short, I move forward and am far more productive for the glory of God. I walked away from this read encouraged and convicted. And if you think you might be the same, then I am happy to tell you that Thomas Nelson has offered to give away one copy of Death by Living to one of you. Would you care to win a copy? Simply leave a comment below including a valid e-mail address. This contest will be open through Tuesday, September 3rd. THIS CONTEST IS NOW CLOSED. The winner, as selected by random.org, is #5 -OBCL HORN. Congrats! Many thanks to Thomas Nelson who sent a copy of this book my direction in exchange for sharing my honest opinion. I have received no additional compensation for this post. I used to follow the mom's blog, and though most of the time I agreed with her, she seemed a little harsh sometimes to me. I don't think I'd like the style - I'm not fond of a steam-of-consciousness format - so don't include me in the drawing. Some day I might like to read something of his just to do so, but I have too many others things stacked up just now. But I can identify with the need to keep the bigger picture in mind. Especially when I am not feeling well or when some big problem is going on, I can feel like it will never end. Oh, do *I* have some Wilson church stories! For another time another place. This book sounds.... interesting. And like you, CB, I do agree with "most" of their theology. I especially like the premise of the book, being an old school Presbyterian (raised OPC as you know) I embrace the idea of living like you are dying. For in embracing death we may enjoy life, if it is well with my soul what have I to fear in this earth? The reason why most early American grave stones have skulls with wings on them is to remind the living that time flies and you had better be right with your Maker! Ooooooh! Pick me, pick me! I'm reading Notes from the Tilt-a-Whirl right now, and loving it. Oddly enough, he writes the way I think when I have quiet moments to think deep thoughts. Since such moments are rare these days, I'm savoring his ramblings! I would definitely like to read this one. Like you, as a mother of eight I tend to get caught up in the "minor" details of the day and often miss the big picture. Thanks! I knew the name sounded familiar, and so when I looked him up, I saw Notes from a Tilt A Whirl, which I had seen around a lot and had JUST decided this week that I really wanted to read. So maybe I'll win and read this book instead!